Vennala, Kochi, March 27: From the small southern Indian state of Kerala, a gesture of respect has been paid to Manu Ginobili- four time NBA champion and an iconic player of San Antonio Spurs who retired from the game in August last year. 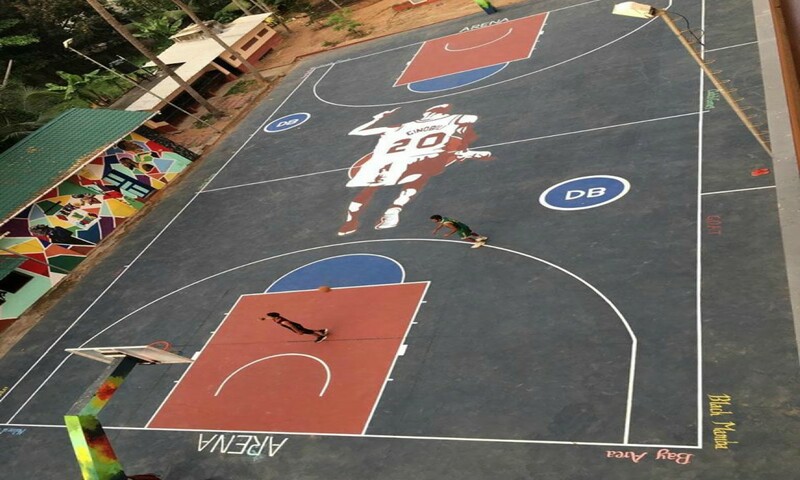 The special tribute came in the form of a mural painting of Ginobili in the centre of the basketball court at Don Bosco Cultural Centre, Vennala, situated in the Ernakulam distrct. The mural painting of the NBA legend was completed a few days prior to the Ginobili’s jersey retirement at AT&T centre –which will happen on March 29th. A basketball court in Buenos Aires, Argentina has already made a mural of the Ginobili as a sign of respect which has inspired the mural painting in Kerala. Ginobili who played with Spurs team for 16 years has been named in the NBA All Star Team twice (2005, 2011) and in two All- NBA third teams (2008,2011).He was also named the sixth man of the year in 2008. On March 28th (29th IST), 2019, Ginobili (20) will become the ninth player in franchise history to have his jersey retired to the rafters, joining the likes of legends like Bruce Bowen (12), Tim Duncan (21), Sean Elliott (32), George Gervin (44), Avery Johnson (6), Johnny Moore (00), David Robinson (50) and James Silas (13). The Don Bosco Cultural Centre’s gesture of tribute is motivation for every aspiring basketball to reach the highest level in basketball.